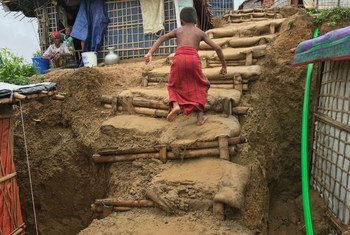 Rohingya refugees endure a heavy rain in Balukhali camp in Cox's Bazar District, Bangladesh, on 4 May 2018. 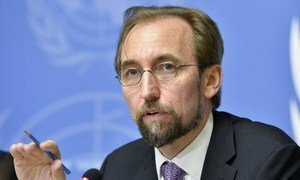 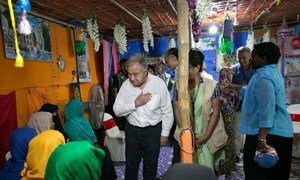 UNCHR chief Filippo Grandi has appealed to regional Governments to offer more support to Bangladesh in addressing the ongoing refugee crisis. 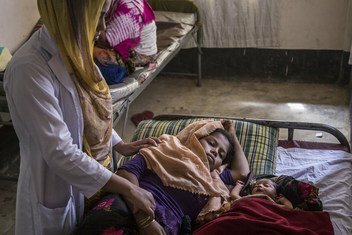 A midwife checks an exhausted new mother, who is recuperating next her 3-day-old sleeping infant daughter at the UNICEF-supported birthing centre in the Kutupalong camp for Rohingya refugees, in Cox’s Bazar, Bangladesh, October 2017.